How to Appeal an IRS Installment Agreement? 29 Mar How to Appeal an IRS Installment Agreement? Taxpayers have their right to appeal an IRS Installment Agreement if the request for the installment agreement is rejected. To be considered, you should appeal an IRS installment agreement within 30 days. And this means the IRS cannot levy your property, garnish your wages, or do any serious action until the appeal ended and the IRS come up with a decision. A Revenue Officer may contact you directly through mail or phone call once the IRS rejects your Installment Agreement. Why an Installment Agreement Gets Rejected? The IRS believes you are living beyond any normal or deprived person can. For instance, you send your kids to private schools or own expensive cars and luxury items. You will receive a mail, or a CP 523 notice, from the IRS once the latter plans to cancel your Installment Agreement. The CP 523 notice tells you the reasons for the termination of an Installment Agreement and it’s also warning that the IRS is going to levy your assets. You have up to 76 days to request an appeal for the termination of an Installment Agreement. But you must appeal within 30 days after the notice was issued or else the agreement will be terminated on the 46th day. If you appeal within the timeframe, then the agreement will be reinstated once your appeal gets accepted. Take note that you can only appeal a termination of Installment Agreement notice within the 76-day period. So you should not let your agreement lapse twice in such a short time period. Contact the IRS and explain to them why you’d like to appeal the termination. Remember that you only have 30 days to appeal or maximum of 76 days. What Triggers the Termination of an IRS Installment Agreement? Appealing for the denial or termination of an Installment Agreement will never be easy. This is why hiring a tax professional is the best option to get you through the right process. 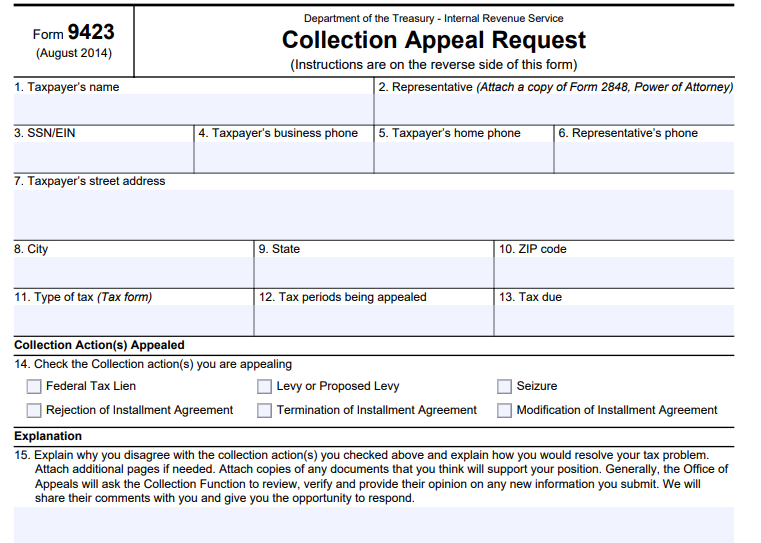 Forms 433 (Collection Information Statement) and 9423 (Collection Appeal Request) can be really difficult to understand for an ordinary person, so it’s better to have a tax professional helping you get through this and have your appeal for an IRS Installment Agreement accepted.